How many times have you approached someone for help and heard “It’s not my problem” or “It’s not my job”? I am sure you have heard this more than once since companies seem to be full of people who chant them as if they were their own personal mantra. These types of responses point to a lack of unity and shared vision. Some people and even entire teams or departments are so concerned with their own success they fail to see that their success is tied to the success of others and the success of the company. They may just be defensive in nature, unwilling to take risks or want to avoid additional work. Regardless of the their reason it is unlikely you will be able to argue them out of their negative attitude. You need to get them to understand that their success is dependent on the success of others and the success of the company. This will require a change in the culture and a new vision for the company. To change these attitudes you must change the culture. One of the best ways to do this is for leadership to implement the vision of one company, one team. This requires breaking down the walls that people and departments build around themselves. People must understand they need to work together at all levels for their company to be successful. You can not have a world-class company or department with such negative can’t do attitudes. A unified mentality can tie employees together and create a sense of pride that nurtures an organization into a great workplace. It starts with leadership developing a vision for the company as a whole. One that brings unity among employees, departments, and teams within the company. This vision provides a direction and a plan for the company to grow and evolve to the next level of organizational success. One company, one team should become the new mantra of your company starting with leadership and working down through every level. This type of mentality will lead to employees, teams and departments actively seeking proactive ways to drive value to the business and promote new levels of cooperation. If we are truly one company and one team when any one of our team members are in trouble we all are at risk. By replacing the negative and defensive culture of “It’s not my problem” and “It’s not my job” with a vision of cooperation and company wide teamwork, you create a culture of shared responsibility for the success of the company. By nature human beings are resistant to change. It will not be easy to change an entrenched culture of only looking out for yourself or your department. To take your company to the next level you must get rid of the culture that breeds a “It’s not my problem”, “It’s not my job” type of negative attitude. It reminds me a piece I saw a few months ago and clipped. Everybody knew that Anybody could do it, but Nobody realized that Somebody wouldn’t do it. And Everybody blamed Somebody because Nobody did what Anybody could have done. I definitely agree with the importance of aligning the team. You can get so much more done when working together. Another aspect is the role of the leader to motivate the team. 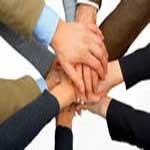 Here’s a great post http://sparxoo.com/?p=286 that talks about team motivation.